Becuase of the vast array of reports available in Vibes, it can be a little daunting to know what report to design to ensure your calls coming into your surgery/business are handled efficiently. During some periods, calls build up, agents can no longer answer them quickly enough, consequently patients/customers become dissatisfied. You now have a collection of patients/customers, that when they touch your service next are disgruntled and are typically more critical of any other issue they may be presented with. When you consider the above 2 points, it gives you a good reason to ensure that within possible limits calls are handled as well as they can be. More often than not, though, lack of information, or knowing what to do with the information present means that these issues go unaddressed. Here is how I manage my queue. Number of agents = number of calls * call duration. Let me explain this. If you typically receive 100 calls in a morning. It will vary over the course of the morning when the peak is. But for the sake of setting targets, which can be reviewed, we say that they happen pretty randomly across the morning. If the average call duration is 5 minutes, then the talk time is around 500 minutes in total. Each agent will also require 1 minute of wrap up time between each call, so you will require 600 minutes of agent time. There are 240 minutes in a morning (8-12). This means you need 3 people taking calls. As a side note, the average call time is on of those things you are most in control of - although it may not feel like it at times. Training your agents to efficient, assertive but fair and how to remain in control of a call will ensure that a call will be handled in a timely fashion resulting in a high percentage of calls being handled in the expected time frame. If you handle 100 calls in the morning and they are perfectly distributed, then a new call will appear in your call queue approx every 2 minutes. If the call duration of 5 minutes is respected, then as there are 3 agents, the agents will stay on top of the queue and the queue should not grow out of control. There is a chance that more callers than expected call and you need to decide what to do if this does happen. How are you going to detect it, how are you going to handle it? Now, with the Vibes board design, first, I need to understand 1 key thing. How long are my callers prepare to wait before they give up? This becomes the absolute threshold when you know they are ticked off. It would be a fair guess that a little under this time they are also ticked off. The average wait time of callers of answered calls. You will notice is a distinct difference between the average wait time of abandoned calls and answered calls. The abandoned calls will be typically very short (immediate ‘I didn’t mean to call them now”) and very long (very frustrated ‘they don’t care about me’) calls. The answered calls will sit nicely up to the threshold of how long callers are prepared to wait. This is the range that you need to aim to answer calls within. The amount you aim for will also vary depending on the type of service you wish/capable of offering. Second, it is important that agents who are taking the calls understand and buy into the strategy you choose to handle calls efficiently. 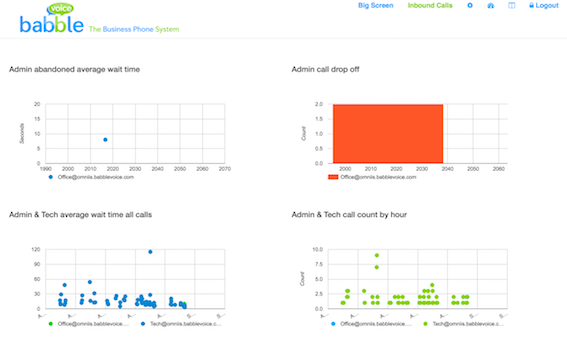 As part of that, you can use Vibes to decide the number of agents you deploy to take calls. You then need to decide on other parameters, like target call duration, the maximum number of abandoned calls in a day. Once you have agreed on those targets, a Vibes board is designed for a large screen format in the area where calls are being taken so agents understand how well they are doing against their targets. Here are the Vibes on my wall board. They are presents as numbers so are easy to read and easy to understand. The mean call duration for calls for this queue. The live snapshot of “number of callers currently waiting” allows staff to delay breaks or extra staff to be called in to ensure this can be reduced if it spikes. The number of abandoned calls can very easily be spotted if it goes higher than expected - or higher than the agreed target. 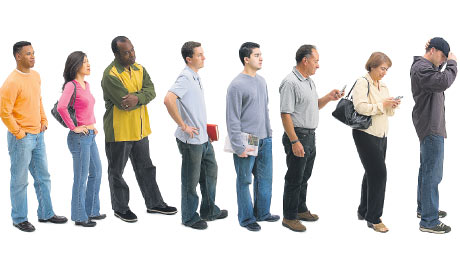 The average wait time can be held against the target time and know time where callers will abandon their wait. Putting all of this into place will improve satisfaction. This then leads to happier patients at the point of them turning up to their appointment (or whatever the second touch happens to be). All to often, in the service industry, we can be blindsided by someone foul mood. Quite often it is the simple things which can prevent that anger in the first place.